When you are the caretaker of a large breed dog, you have a lot of responsibilities. Large dogs, like Mastiffs, German Shepherds, Saint Bernards, and Malamutes, require much different care than their medium and small breed counterparts; particularly when it comes to feeding them. It stands to reason that you want your oversized furry friend to live a long, healthy, and happy life, and – like all species – quality of life begins with proper nutrition. According to veterinarians and animal nutritionists, it’s important for pet owners to provide dogs of all sizes with high quality foods that will meet their nutritional needs; and the dietary needs of large breed pups is much different than that of smaller pooches, like Beagles, Pugs, Scottish Terriers, and Chihuahuas. But exactly what type of nutrition do big canines need? And what type of dog food will meet those needs? If you’re seeking answers to these questions, you’ve come to the right place. In this review, we’ll shed light on the dietary needs of large breed dogs and let you know why it’s so important to ensure that those needs are being met. But first, let’s start by sharing what food choices are the best for your oversized best friend. We’ve reviewed a large selection of dog food brands and formulas to determine which options are the best for large breed dogs and narrowed down the options to five types that we consider to be the best dog food for large dogs. Why Do Large Breed Dogs Need Specially Formulated Food? Now that you’ve seen our selection for the top five large breed dog food formulas, let’s investigate each option in a bit more detail. Below, we offer a more in-depth overview of each option, including the ingredients they contain, why the will meet the nutritional needs of your big pup, what we like about them, as well as what we pet parents who have used these options thought about each one. Once you have finished reading the reviews and have decided which one will best meet the needs of your large pooch, click on the buttons to find the best prices currently available on Chewy and Amazon. Blue Buffalo dog food is a brand that many pet parents trust the most. Offering a variety of different formulas to meet the nutritional needs of pups of all ages and sizes, and using only the highest quality ingredients, it’s easy to see why Blue Buffalo is a superior choice. Their Life Protection Formula Natural Adult Large Breed Dry Dog Food is formulated specifically for big pups. Every Blue Buffalo formula features real meat as the first ingredient, so you can ensure that your pet will be receiving the protein that he needs to support his lean muscle mass. In this large breed dog food, the protein is sourced from premium cuts of deboned chicken and chicken meal. To further promote the development of lean muscle mass, which is exceptionally important for large pooches, as it can help prevent joint health problems, which oversized dogs are prone to, Blue Buffalo infused this food with L-Carnitine, glucosamine, and chondroitin. It also contains a variety of nutrient-rich fruits and vegetables, like peas, carrots, blue berries, and cranberries. It’s also formulated with vitamin and mineral supplements to further enhance the nutrient profile. If your pet needs a dog food for sensitive stomachs, the fact that this recipe uses natural carbohydrates like sweet potatoes, whole ground barley, and oatmeal for easy digestion. It’s free of corn, wheat, and soy, so it’s also a grain free dog food. Most pet parents say that they are very happy with the quality of this food and the nutrition that it offers their large dogs. 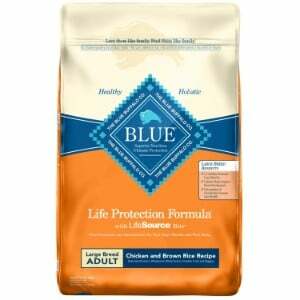 Final Verdict: For a healthy, natural food for your large breed dog, Blue Buffalo Life Protection Formula Natural Adult Large Breed Dry Dog Food is a great choice. Made with premium cuts of chicken, fresh fruits and vegetables, and infused with essential nutrients, this dry dog food will keep you – and your pooch – happy. 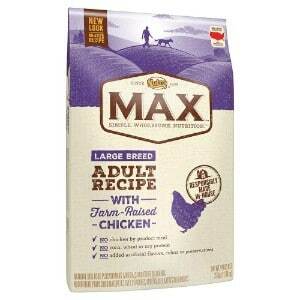 Another high quality dog food for large breed dogs is NUTRO MAX Natural Adult Dry Dog Food. This formula is made specifically for adult dogs, as it is packed with the essential nutrients that they need to thrive. It’s made with high quality ingredients and contains no poultry byproduct meal, corn, wheat, soy, artificial colors, flavors, or preservatives, so it offers all of the wholesome goodness that your pooch needs and none of the bad stuff that he doesn’t. This recipe contains real chicken, as well as chicken meal, which is a natural source of glucosamine and chondroitin sulfate, so it will give your furry pal the protein that he needs to nourish his muscles and joints. Brewers rice, whole grain oatmeal, flaxseed, and whole brown rice are natural sources of carbohydrates that are easy to digest, so it won’t upset your pup’s stomach. It’s also infused with essential vitamins and minerals, like vitamin B12, niacin, zinc, vitamin E, riboflavin, vitamin D3, potassium, and folic acid for a well-balanced meal that your pup will love. According to pet parents who use this formula, their pups’ love the taste and overall, they are very pleased with the nutrition that it offers. Final Verdict: For a healthy, well-balanced meal that your dog will love. Pet owners say that even the pickiest eaters gobble up this formula. It’s made with premium quality, wholesome ingredients, and is completely void of artificial flavors, preservatives, and colors. Our panel of experts gives it two thumbs up. Hill’s Science Diet dog food is another highly trusted brand that pet owners’ have been relying on to nourish their canine companions for nearly 60 years. Their Adult Large Breed dog food is formulate for large breeds that are 6 years or older and weight more than 55 pounds, and giant breeds that are 5 years or older and weigh more than 110 pounds. Made by a team of PhD nutritionists, food scientists, and veterinarians, this recipe contains all of the nutrients that your big pup needs to thrive. Featuring real chicken as the first ingredient for optimal protein levels and real sources of glucosamine and chondroitin, you can be sure that your pet’s joints will be strong and healthy to maintain an active lifestyle. The addition of a precise blend of antioxidants, vitamin C, and vitamin E will also keep your furry pal’s immune system in tip-top condition so that he is prepared to fight infections. With natural sources of carbohydrates that are easy to digest, like brown rice whole grain oats, and cracked pearled barley, this formula is ideal for large dogs that have sensitive tummies. The inclusion of real fruits and vegetables, like apples, broccoli, carrots, cranberries, and green peas, further enhance the nutritional value and add natural flavor. It’s also fortified with essential nutrients, like omega 6 fatty acids, to keep his skin healthy and make his coat fuller and more lustrous. Most pet owners say that their large pooches gobble up this food with no problem. They also note that they are very pleased with the nutrition that it offers. Final Verdict: For adult large and giant breed dogs, you can count on Hill’s Science Diet Adult Large Breed Dog Food to provide the nourishment that your four-legged family member needs. It’s made with premium ingredients that have been hand-selected to offer large breeds the essential nutrients that they need. If you’ve been told that your large or giant breed canine companion needs a high protein dog food, you should strongly consider Diamond Naturals Adult Large Breed Real Meat Recipe Premium Dry Dog Food. 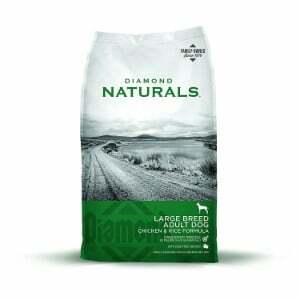 With a minimum crude protein content of 23 percent, which is sourced from real chicken, this Diamond Naturals dog food will help to maintain lean muscle mass and keep those joints healthy. It’s also fortified with glucosamine and taurine, which further enhances joint health. In addition to offering a high percentage of high quality protein, this formula also contains a variety of wholesome ingredients to fully nourish your pet. It contains whole grain brown rice, cracked pearled barley, peas, and rice brain for easy digestion. What really sets Diamond Naturals apart from other food for large breed dogs is the unique blend of superfoods that it contains, like pumpkin, kale, chia seed, quinoa, dried kelp, coconut, spinach, and papaya. These are ingredients that you just don’t find in other brands of dog food. Not only do they enhance the nutritional content, but they also make this food more palatable and appealing to picky eaters. To ensure that your pet is receiving a well-balanced meal, this recipe is infused with a bevy of supplemental nutrients, like vitamin A, biotin, calcium, manganese, vitamin B12, zinc, copper, and iron. Final Verdict: When you feed your large breed pup Diamond Naturals Adult Large Breed Real Meat Recipe Premium Dry Dog Food, you can have confidence knowing that he will be getting the balanced nutrition that he needs. Featuring unique ingredients, including superfoods, vitamin and mineral supplements, and a high protein content, this food will help to maintain your furry friend’s overall health and well being. 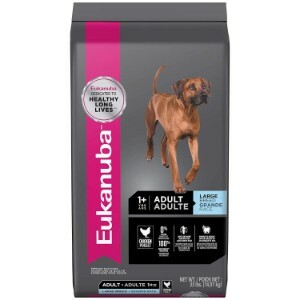 Last up on our list of the best dog food for large breeds is Eukanuba Adult Dry Dog Food Chicken. Like all of the other options featured in our review, Eukanubla dog food is a highly regarded brand that pet owners have been trusting for years. The manufacturer offers a variety of formulas for dogs of all shapes and sizes, and this recipe is made specifically for large breed adult dogs. Featuring prime cuts of chicken as the first ingredient, and natural sourced of glucosamine and chondroitin, this formula will help to support healthy joints. Since some large dogs have delicate digestive systems, Eukanuba incorporated a specialized fiber system, which is made of natural beet pulp and preboitics to improve digestion and enhance the absorption of the nutrients that it contains, such as vitamin E, potassium, zinc, B vitamins, vitamin D3, and copper. Omega 3 and 6 fatty acids will keep your furry friend’s skin healthy and his coat shiny, too. Lastly, the larger kibble is designed for larger mouths and helps to minimize the buildup of plaque and tartar to enhance oral health. Final Verdict: For balanced nutrition for your large breed adult pup, Eukanuba Adult Dry Dog Food Chicken formula is an excellent choice. 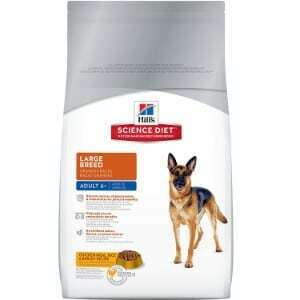 It contains essential nutrients that large dogs need and contains premium quality ingredients to support overall health. It goes without saying that large breed dogs need different care than medium and small breeds. They need specialized products that will support their size; a dog bed, a dog crate, and even a dog house and dog collar needs to be sized accordingly in order to properly fit the girth of bigger dogs. The type of food that you fill your large pup’s dog bowl with also needs to be chosen carefully to ensure that it meets his needs. Why do big dogs need specially formulated food? How can you tell what type of food will meet the nutritional needs of your large pooch? In this section of our review, we’ll answer these questions so that you can make sure that you are selecting a dog food formula that will keep your four-legged family member in the best health possible. While canines of all sizes do share some similar characteristics and require the same basic care, it’s important to understand that dogs of different sizes do have different needs; particularly in regard to nutritional. Believe it or not, larger dogs need fewer calories than their smaller counterparts. That’s because they have a slower metabolic rate, which means that they aren’t able to burn calories as fast as small breeds. Therefore, feeding your big pooch food for small dogs can lead to weight gain, as these types of food are specifically formulated for small breeds and have more calories to fuel their higher metabolic rate. Like humans, when canines consume too many calories, they can become obese, and obesity can lead to a variety of health problems; diabetes, gastrointestinal issues, and orthopedic issues. Additionally, many large breed dogs are genetically predisposed to joint issues, like hip and elbow dysplasia. For that reason, they require the right balance of nutrients that will help to support their joint health, such as protein, glucosamine, calcium, and phosphorus. Dog food that is specifically formulated for large breeds has a reduced calorie content and contains the vitamins and minerals that they need to ensure they are maintain optimal health. High quality protein. A reliable formula for large breeds will contain natural sources of protein, and they will be included as one of the first ingredients. Protein, as mentioned, is vital for large dogs, as it is the building block of lean muscle mass and supports joint health, and can therefore help to prevent orthopedic conditions like hip and elbow dysplasia and arthritis. Natural carbohydrates. Large dogs can have sensitive digestive systems. Look for natural sources of carbohydrates that will offer your large pooch the energy he needs, but will also be easy for him to digest. Examples include brewers rice, barley, quinoa, and whole grain oats. Vitamins and minerals. High quality dog food for large breeds will also be infused with essential vitamins and minerals to support optimal health. Free of byproducts. Byproducts can cause serious health issues in dogs of all sizes, including large breeds. Make sure that the food you select is free of byproducts and ingredients that you can’t pronounce. If you aren’t sure what type of ingredients you should be looking for, speak to your veterinarian. He or she will be happy to suggest a premium quality dog food for large breed dogs. To find the best dog food for large breeds, we enlisted the help of veterinarians and animal nutritionists. This panel of experts helped us analyze the ingredients in a variety of different dog food options for large pups. Based on their input, and the information that we obtained from countless reviews offered by pet owners, we were able to narrow down the options and compile a list of what we believe are the top five dog food choices for large breeds. To ensure your large pooch is getting the well-balanced nutrition that he needs to thrive, make sure that you do your due diligence and select a premium grade pet food. All of the options listed in our review contain the highest quality ingredients, offer the calorie content that large breed dogs need, as well as the essential vitamins, minerals, and nutrients that they require.